Megan Wingfield is a native of Mid Wales and has moved house many times up and down the Welsh Border, from Ross-on-Wye in the south to Prestatyn in the North. She has a son and daughter, and now lives with her husband in North Powys. 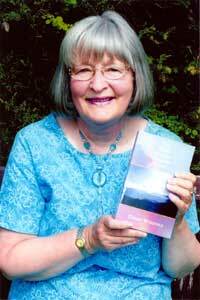 It is with the help of family and friends that her books have been produced. A teacher who has trained both in healing and colour therapy, Megan considers herself primarily to be an artist. It was through painting that she found herself to possess the ability to "tune in" to spiritual realms. Her first book, Light is the Rainbow Bridge came from pictures received in meditation and the spiritual guidance which accompanied them It is a "thought for the day" book, useful for divination. Megan's latest book The Grail Journey Through Wales, charts a journey across the spiritual and physical landscape of Wales and surrounding areas of Britain. Her discovery is the Pathway of the Beloved, Merlin's Way, an energy line stretching from the Scilly Isles through Wales to Whitby, Yorkshire. Megan's attunement gives her the ability to "read" the energy at sacred sites, translate it into pictures and take dictation from spiritual beings. This has led her and her friends and family on an odyssey which was both a physical pathway and a Grail journey. This is ongoing. Megan's other main interests are in animal conservation and the rainforests' survival. She has bought many acres of forest and hopes to buy many more which are held in trust for perpetuity. She is a dog lover with a particular fondness for Tibetan terriers.